I recently jumped on the Pinterest bandwagon. “Recently” being within the last few months or so. Some of you probably follow me, and if you do, you’ve probably noticed not much pinning happening. I have a personal Pinterest account where I do most of my Pinning. It’s quite possible I have forgotten my ATHG Pinterest login and can’t be bothered to reset it. Since joining Pinterest, I’ve developed a very conflicting view of it. For one, I really like having a visual reference for things I’d like to do or try. I tend to pin the things that I once would have bookmarked. It’s much easier for me to find what I’m looking for later on when there’s a picture to go along with it. I find Pinterest is a great resource for connecting me to recipes and inspiring visuals. On the other hand, it bugs me to no end the way some people use Pinterest. I personally don’t believe in repinning something that doesn’t link back to the original source. I think it’s wrong to use someone’s idea or share their image without revealing the source. In fact, I have on quite a few occasions spent some time hunting down the original source to pin, rather than repin uncredited, “borrowed” ideas. Recently there’s been a lot of hoopla surrounding Pinterest and copyright concerns. They even changed their terms in April in response. Am I making a big deal out of something that many view as harmless fun? Maybe, but I know I’m not alone. To me, it’s like the old Spongebob debate I have with my students (or whatever the popular character of the moment is). You weren’t the first one to create him, you can’t put him in your work and pass him off as your own. But I’m getting sidetracked here, because what I really wanted to do was share something I found the other day. Just prior to joining Pinterest, I realized that this blog had been pinned quite a few times. I thought that was pretty cool and totally unexpected. It always amazes me when I think about the various nooks and crannies of the interwebs ATHG has reached. Every now and again, I confess, I like to search for new pins of ATHG to see what others are saying about it. Call it curiosity, call it narcissism, whatever you call it, sometimes I just can’t help myself. The Red Arrow: Andrea is mistaken. I don’t hate my life. I, in fact, love my life, including my job. But Andrea’s comment isn’t the one that really gets to me, it’s Liz’s. Where do I began with this? To imply that I don’t have any fun with art because I’m not a fan of glitter is ridiculous. Is glitter the only thing that makes art fun? Does art class need to be dolled up and turned into a sparkly, gluey mess in order to appeal to kids? No, it certainly does not. I have a confession to make. I’ve used glitter in my art room before (not recently, but certainly in the past). I have to say, in my experience, glitter isn’t what makes art “colorful, shinny [sic], unique, imaginative and creative.” I mean, if you have to rely on glitter to do those things for your art curriculum, than you have bigger problems. Now, here’s where I get confused. Andrea goes on to say, “I’m completely offended and disturbed by this photo and the Anti “HATE” comments surrounding it.” The photo that she is referring to, which didn’t make it into the screen shot, happens to be my header image. Hmmm… I wonder what part offends and disturbs her? Is it the bright, happy colors? The whimsical birds and flowers? I also wonder about these “Anti “HATE” comments” she refers to. If she in fact hates hate, as she states in her next comment, then shouldn’t she be pro-Anti hate? And really, what “comments” are she referring to? In my opinion, the word hate has gotten a bad rap. I think in certain contexts, using the word hate is perfectly acceptable. Would I ever tell someone I hate them? No. Do I hate doing the dishes? Yes, and that’s okay. I get absolutely no enjoyment out of doing the dishes. I hate it. I also hate lima beans. Lima beans have no feelings. It’s okay to hate them. Do I hate glitter? No, not really. What I hate is the mess involved with using glitter, the way in which some students use glitter and the implication that art is all about glitter and Popsicle sticks. Kudos to Courtney, who obviously has a sense of humor. I think it’s safe to assume that Liz and Andrea have never even visited the ATHG blog, and therefore their remarks are based on the image alone. This is another thing that bugs me about Pinterest (and really, just about every other social media site); people who blindly react to and comment about things without educating themselves on the issue they’re commenting on. Le sigh. Am I going to let these sorts of comments get me down? No, but that doesn’t mean it doesn’t affect me on some level. It continues to amaze me how often people feel the anonymity of the internet gives them the right to “hate” on other people. I don’t know Liz. I don’t know Courtney. They each have a right to their own opinions, regardless if how uninformed and misguided they may be, and as an adult, I have the ability to forget this ever happen and move on. The Green Arrow: I’m currently reading Sacre Bleu by one of my favorite authors, Christopher Moore. I’m not that far into it yet. I’m excited about this book because 1. it’s written by Christopher Moore, 2. it’s about my favorite color, and 3. it centers around the death of Vincent van Gogh and includes Henri Toulouse-Lautrec. Has anyone else read this book? How is it? I’ve heard mixed things. The Yellow Arrow: I recently Googled this because my 8 month old baby has yet to roll over from her back to her front. Should I be concerned about this? She shows next to no interest in becoming mobile. Instead of attempting to get to the objects farther away, she entertains herself with the objects close by, or lacking that, screeches and “yells” until she is “rescued” from her ordeal. Double le sigh. Some people have no sense of humor! I love your blog too, don't let the haters get you down. Glitter is ok, but I agree that it does not make an artwork “creative” or unique. it's just another embellishment.. more crafty than anything. I rarely use glitter in the classroom. As for baby, maybe talk to your doctor about it, but kids develop at all different rates. Does she sit up yet? I was worried because my 7 month old showed no signs of wanting to go from back to front either. We called him turtle because if he accidently flipped onto his back he would be stuck there until he started screaming bloody murder for someone to rescue him. About 2 days ago he decided enough was enough and make the roll. I don't know what the timeline is for when to worry about things but I guess at your next dr appointment if it bothers you bring it up. That was my plan if he hadn't figured it out by then. Good luck! And your blog is awesome, other people are dumb. You know I love your blog, love your snarkiness. Keep it coming and ignore the ignorant (just noticed how those two words go together). I am so with you on the glitter! your title is how I found your blog and I love your comments and attitude. Please keep writing! I am so sad about your experience w/day care…sounds like they should be called the daycare not. You sound so connected to your baby, many people don't understand how important that connection is! as a mother of four and grandmother of 1, I can say for sure, every baby is different and there is no formula for parenting that works for every baby. You are doing a wonderful job as a mother! I think that their comments stem from misinterpretations and oversensitivity. Obviously you are not saying that you hate glitter in all aspects of life (as they must be assuming), nor are you saying that glitter is evil. But I would assume that what you really mean, is that as an art teacher, you hate using glitter because, as you said, of THE MESS that it creates. Internet comments really irk me with their ignorance, especially when people overreact about something that they know nothing about, or that was clearly a joke, but flew right over their heads. Also, I have not heard of the book but I'm now planning to find it. I thought back to all my years in school and I can't recall me using glitter being my idea… not once. Some people just want to be negative online. Some people are always positive online. It's just the way it is. “Haters gonna hate” I feel was coined for those people who spew negativity but are illogical about it. I enjoy your blog and hope you don't let the negative or positive get to you too much! I hate glitter in my art room too. I never buy the stuff, but somehow, I end up with bottles of it. My problem with glitter is that kids have no moderation. When you give them glitter they will put it everywhere, and instead of embellishing the art, it ends up being distracting and tacky. For this reason, I never use glitter in my classroom. I just read the onion article-Too funny!! I have to admit that I do use glitter in the artroom-HEAVILY SUPERVISED! I have been a glitter baby since the days of disco and ther's no stopping me now! I have the kids apply the glue on their project at their table and them come over to me at the “Glitter Center” where I sprinkle the glitter of their choice for them and then immediately recycle the leftover glitter back into the bottle. I particularly like the Martha Stewart brand of gold glitter because it is so fine,not chunky like most glitter. I hope some of you will reconsider your dislike for glitter beacause it makes kids really happy! Sometimes things can just get to you and they are tough to shake! I love your site and I read it b/c it gets me thinking about things I may not have encountered yet (i teach a more limited number of students right now). I think your writing is authentic and probably lets your unique personality come through (as it should)–not every blogger's “voice” is going to be right for everyone, but I do agree that their comments seem to show that they are commenting on something they haven't actually checked into (grrr….that is so frustrating to me too). Keep up the good work, Really. I also think glitter is like cilantro, you either love it or hate it. I personally don't have feelings about glitter either way (like cilantro). I really don't think to include it in my classroom (b/c of the mess, i guess), but I do enjoy a bit of sparkle now and again (glue on gems, gold and silver paper, metallic paint, etc.). But I find parents are WAY more against glitter than I would be. Oh well, whatever. I likened your aversion to glitter to be similar to my illustration teacher's take on color. When a student would show a B & W comp drawing to my illo teacher in college and say “I know it's hard to read this line drawing, but once I add color…” she would say, “No way. Your drawing has to stand on it's own.” Glitter may be great, but it can't BE the artwork. You need a strong piece of art w/o the bling. (BYW: my fourth child, a girl, didn't roll over until three days b4 her first birthday. She could sit up though and talk like crazy so I wasn't worried too much. But if she fell over she would look like a little beetle flailing her arms and legs until her brothers came and rolled her over). Ah, life, you have to laugh about it. Sorry for the long comment, but I had to reach out and show my support for ya! Whatever! No sense of humor! So sad! I think putting myself out there on social media leaves me vulnerable to hurt feelings. I'm so glad you take the risk & do it anyway. I know I feel good after reading your words, so thank you. Resilience is my word of the year (a short version of a new year's resolution) so thanks for the reminder. I actually forgot. Also, no way on glitter but love a layer of glitter paint on a starry night, for example. The kids do love it. Custodians appreciate my restraint, too! I posted about glitter in your honor -because that is how awesome you are…. if you don't recall! And what I get about your title is not just simply that you hate glitter, it's more about bringing up and talking about the misconceptions and issues that face art teachers – The honest facts, which you do so beautifully. I just read this post and am a little late on a reply but I find those girls comments to be hilarious. 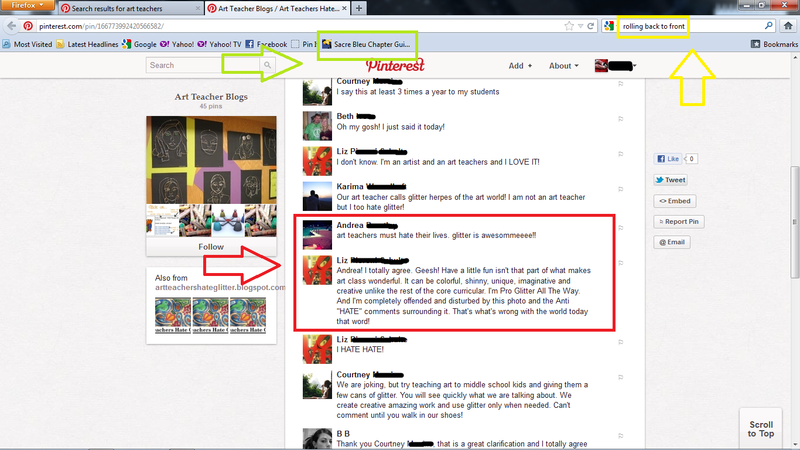 They must not teach because if they did they would hate glitter too. I love how gliiter looks on projects but hate to have it all over me, my tables, my floor. I could keep going on and on. I HATE GLITTER TOO. I LOVE your blog!!!! oh pinterest! while i love all the traffic to my blog, it's just a little frustrating to see so much enthusiasm for things that are old news to me. how about some love on my recent posts? that's what i'm most excited about–things i'm currently doing, new thing for this school year, etc. my art class jobs (modeled after katie gonzalez) have been getting a lot of traffic lately. it was particularly frustrating when they showed up on a board i follow, and with negative comments! it was right there on my pinterest news feed! in a moment of weakness, i actually commented back. my roommate called me out on it later. she said “didn't you learn anything from josh on the west wing?” but really folks, i know, i KNOW how silly the title “stool inspector” is…and that's precisely why i used it! my 85% non-native speakers don't know any other meaning for the word stool, but it brings a smile to my face, and any other adult that stops in my classroom! but alas, i wasn't consistent with assigning jobs so after a year of almost never doing it, i removed the jobs from my classroom this year. for the record, i also removed all the glitter from my art room in my first year. passed it off to classroom teachers for holiday crafts in december! though i have a post i'm about to write called “you can take the glitter out of the classroom…” some kids found a way to add glitter to their work just last week!